You'll soon be seeing some new developments in downtown Milwaukee. Reporter Tom Daykin speaking with Lake Effect's Joy Powers. From the opening of the Fiserv Forum to the Milwaukee Streetcar, 2018 was a year of major changes for downtown Milwaukee. But 2019 may prove to be even more transformative for the central city. There are several ongoing projects that will dramatically alter Milwaukee’s skyline. Some will rejuvenate areas that are currently marred by vacant buildings. Others will impact public transit, the city’s lakefront, and some of our most cherished institutions. Tom Daykin, a reporter covering commercial real estate and development for the Milwaukee Journal Sentinel, lists the top five developments to watch in downtown Milwaukee. "What's happening there is, basically, no more mall. It's been dying for years anyway," says Daykin. Over the years, there have been different plans to revamp the space, but none have come to fruition until The Avenue. Parts of the Plankinton Arcade have already been converted into high-end apartments, and they are starting to lease out the properties. Now, they are starting work on the newer portion of the mall. "They just announced that the first floor is going to be converted into Third Street Market Hall," says Daykin. "That's going to be a food hall, not a food court ... so about 20 local vendors with made-from-scratch meals." The upper levels of the mall will be converted into office-space and there is already an anchor tenant in place: Graef, a planning, engineering and design firm. A rendering of the Symphony Center. Last year, the Milwaukee Symphony Orchestra announced plans to redevelop the Warner Grand Theater complex on West Wisconsin Avenue. The space has been mostly vacant for more than 20 years, and Daykin says the project could transform a part of downtown where development has been lagging. "To get that being reused, redeveloped is really a big step forward for West Wisconsin Avenue in general," he explains. "You combine that with what’s happening with The Avenue ... and that’s finally starting to bring West Wisconsin Avenue up to the level that much of the rest of downtown has been at in the last few years." 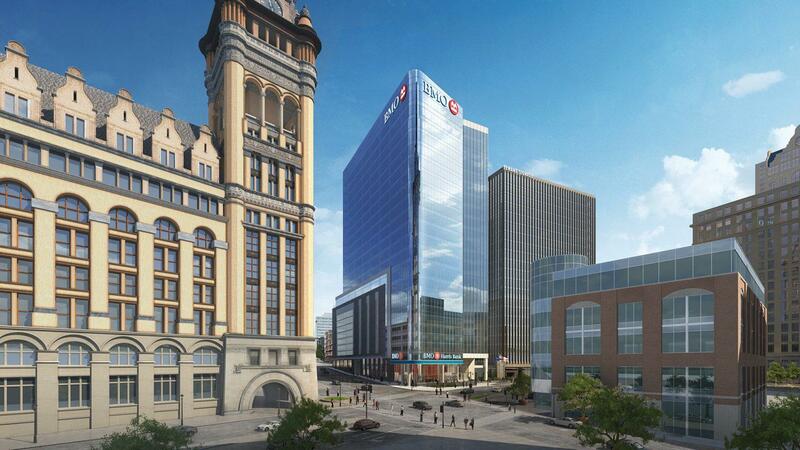 A rendering that shows the BMO Tower. Over the past year, a lot of progress has been made on the BMO Tower, which will stand at the corner of Water and Wells Streets. Construction started in 2018, and the Tower will impact the Milwaukee skyline. Daykin says, "It's going to end up being one of the taller office buildings in downtown Milwaukee at 25 stories. Right now, everyone in Chicago is laughing at us, 'cause 25 stories. But, OK, it's Milwaukee — 25 stories is a thing." The new office building will replace its old location just across the street. Plans for the old space are still forming, and Daykin says he expects to see a clearer picture of how the developers plan to use the old building when the BMO Tower is completed (anticipated in late 2019). A rendering of the Couture building. Milwaukee’s much-anticipated Couture building will transform the city’s lakefront, eventually. "The 44-story, 300 plus, high-end apartment building development that presumably has been pursued since the Eisenhower Administration — hasn’t been quite that long, it’s been a few years. And has taken a big step forward in its financing," Daykin explains. When completed, the Couture will be one of the tallest buildings in the city. 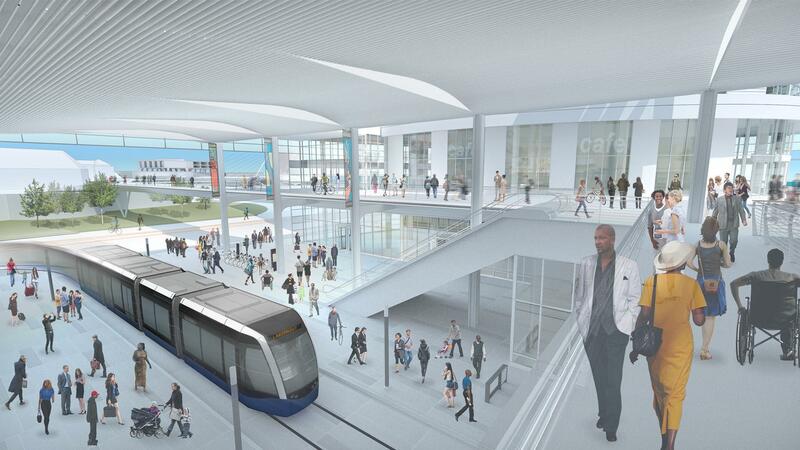 It will feature a transportation hub, including a stop for the Milwaukee Streetcar, as well as a pedestrian bridge connecting the building to the city's lakefront. The area around the Harbor District has been changing rapidly over the past few years. 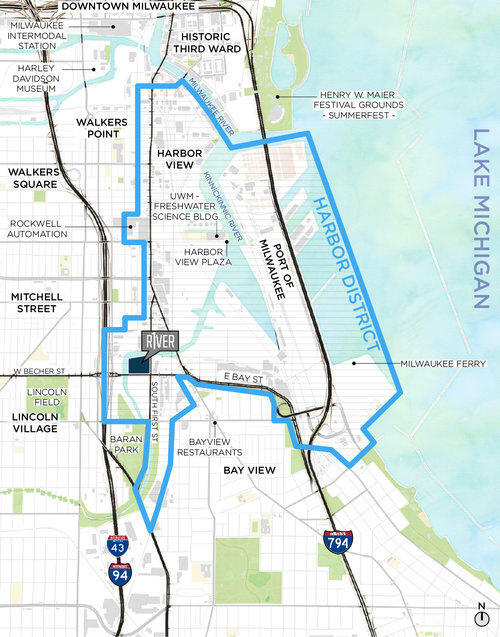 As more businesses and residents move into neighboring Walker's Point, developers have been working to revamp and revive the Harbor District. The Harbor District is located south of the Historic Third Ward, north of Bay View. "It's really interesting. If you're on First Street you see a lot of new restaurants, you see new apartments," says Daykin. "As soon as you move east of First Street, you only have to go a block or so, and you are in a very different world. [It's] very industrial, lot of empty lots, lot of buildings that are no longer being used or are being under-used for storage or other purposes." This year will bring big changes to the area, including the construction of the Komatsu Mining Corporation's headquarters and R1ver, a large office building anchored by the Michels Corporation. Employees at Oak Creek-based Master Lock will spend the next few weeks getting used to a new workspace. Starting Monday, the company begins moving into its new corporate headquarters, just a couple miles from its current offices.